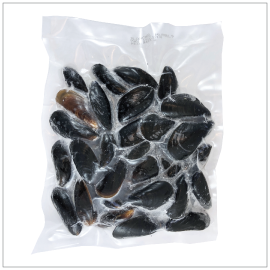 These premium Blue Mussels come from Canada's PEI (Prince Edward Island), known throughout the industry for freshness. These mussels are observed intensely before harvesting, to insure only those of a specific size are chosen. To ensure your thawed, prepared product tastes great, close attention is also paid to the heating time during processing. The shells are also carefully polished, removing all dirt and algae for a beautiful presentation. These taste great simply boiled as they come, but can also be enjoyed in a wide variety of ways, like salted and steamed in sake, or white wine, oven baked, or added to a hot pot, pasta, paella, and more!